The sun was setting on a peaceful but busy Saturday afternoon in San Clemente. I arrived at Village Mediterranean Rim* with my boyfriend, Fred, promptly at 6 pm & we were greeted after a few seconds. We were seated at a two top table & waited for someone to come around with the menu. Meanwhile, I eyed the place. The interior was small, dimly lit, & packed. At any given time every table was occupied save for one. With low ceilings & many people, there was a constant bustle of chatter. I found myself leaning closer to Fred in order to hear anything he said or vice versa. Everyone seemed joyful, smiling, talking. One couple stared into each others eyes as they held hands from across the table. 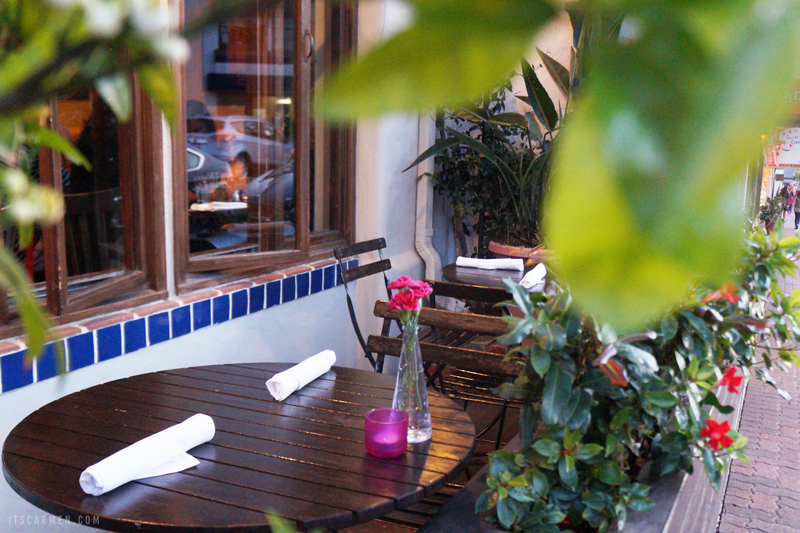 The outside patio with two small tables was filled with beautiful foliage — my favorite spot of the restaurant. Our server was John. He was attentive & glad to answer any questions, which there were many of. I consulted with him on what to get or if he had any particular recommendations. He was able to reply to my inquiries & make vegetarian-friendly suggestions. We began with the Chermoula Dip appetizer. It's a small plate but packs mean punch of flavor. 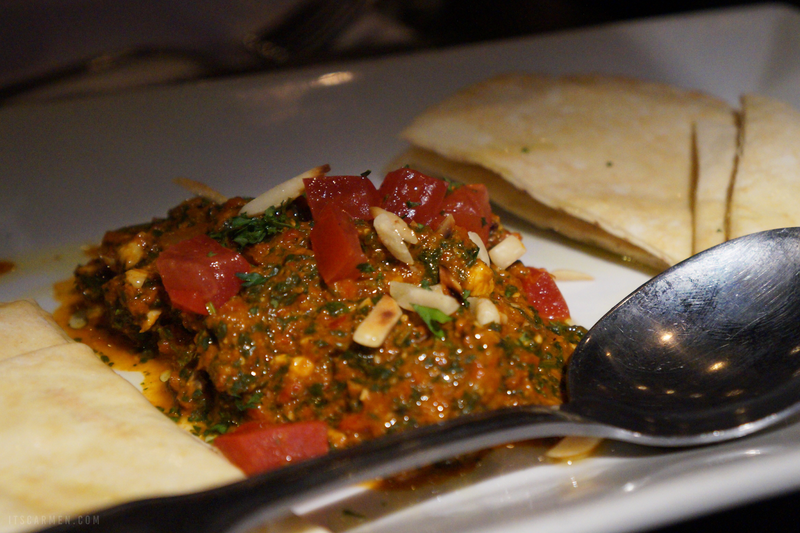 The chermoula comes with roasted pepper, harissa (hot chili pepper paste), cilantro, almonds, & pita. The bits of almond gave it the perfect amount of crunch while the harissa supplied a kick. We got the special of the evening — the Roasted Asparagus & Farro Salad with Italian parsley, baby greens, tomatoes, cucumber, corn, feta cheese, & of course, asparagus & farro. The asparagus was soft & smoky, while the farro added texture. This harmonious rainbow of ingredients created a complex, satisfactory salad. 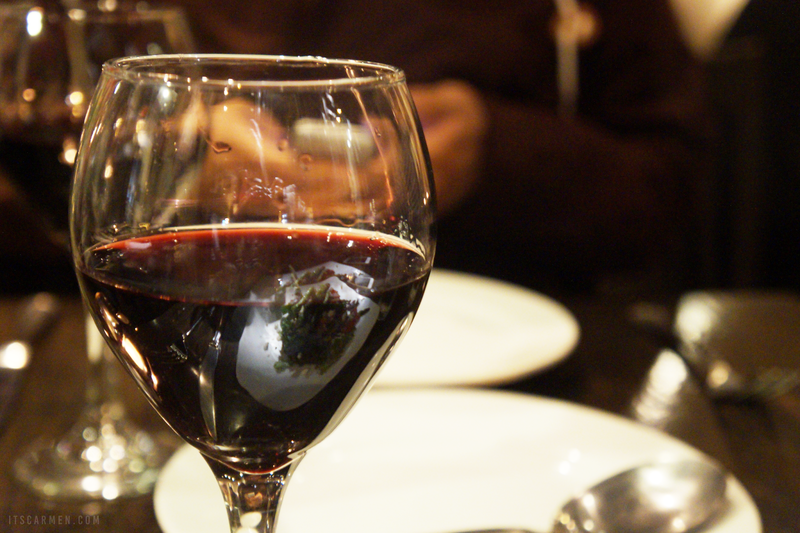 As a complement to our food, we tried the Rio Madre Graciano Rioja, a full-bodied red wine. It went down mercifully, every sip better than the previous one. It paired gloriously well with the main course. For the main course, we tried the Vegetable Tagine with a side of the house made gnocchi instead of the couscous, as per John's recommendation. Tagine is a slow cooked Moroccan stew. 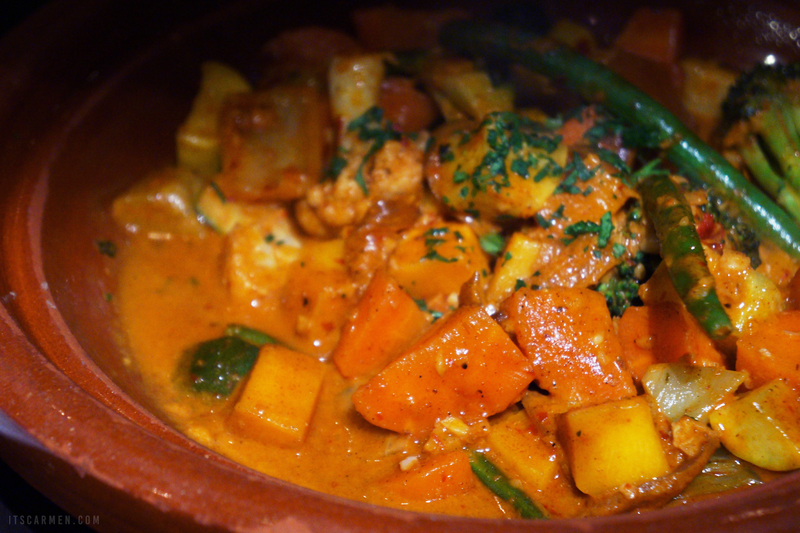 The vegetable version came with organic seasonal veggies, walnuts, olives, dried apricots, figs, & Moroccan curry sauce. 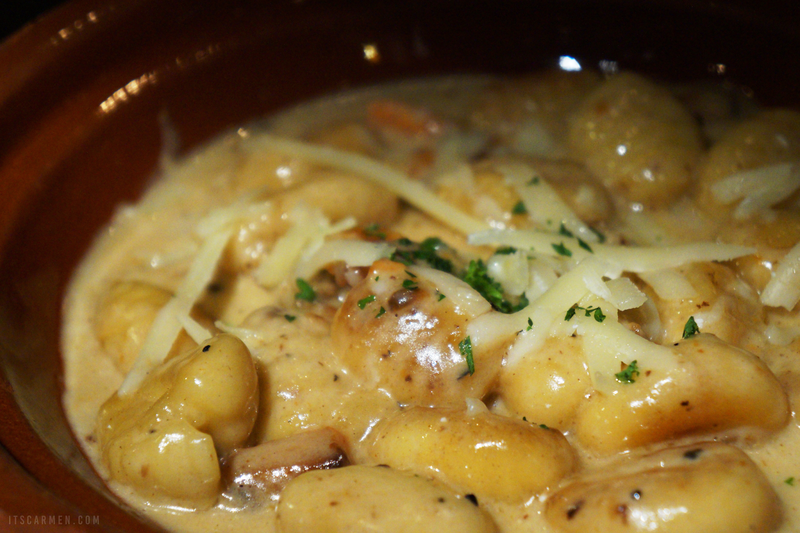 I got goosebumps eating the gnocchi & its creamy, cheesy sauce; it was incredibly rich, thick, & cheese-tastic. Although the creamy gnocchi & curried veggies seemed like an odd combination, it turned into a peaceful mixture. 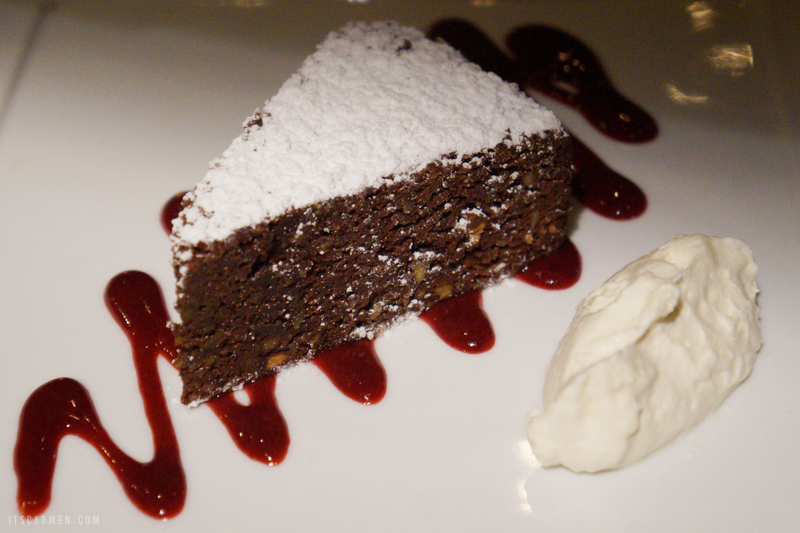 Upon consulting with John once more, we decided to go with the Chocolate Pistachio Torte with marscarpone cream & berry compote. It looked exceedingly rich but was surprisingly light & airy. The berry compote was striking; I wish I had a jar of the stuff. Overall, my experience was an exceedingly pleasant one. 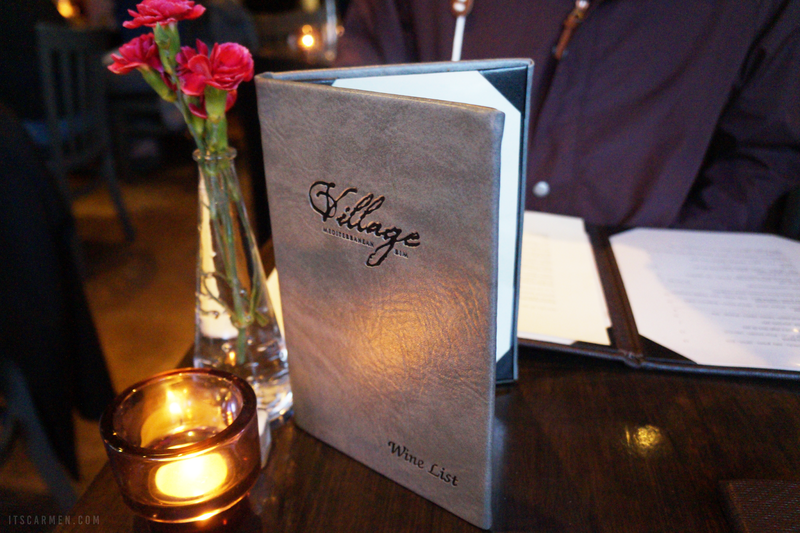 Village Mediterranean Rim contributed to the perfect date night. 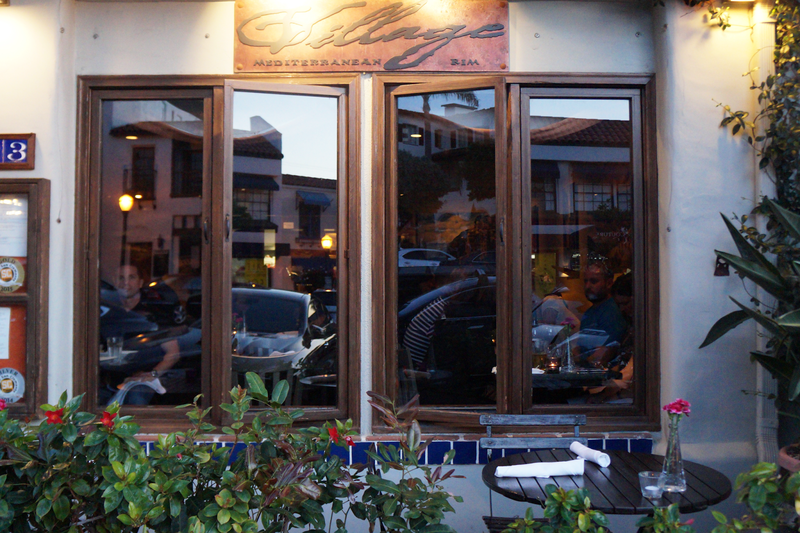 I would recommend taking a seat outside to relieve yourself from some of the noise & heat of a packed restaurant. 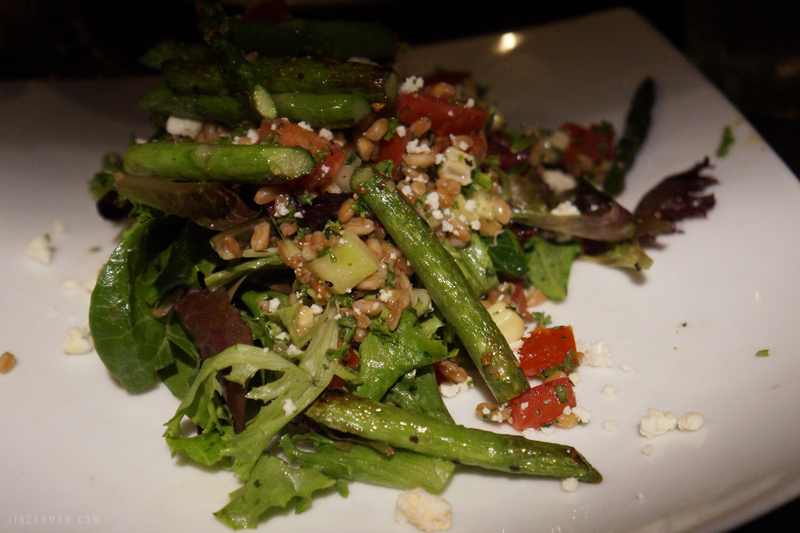 Both Fred & I agreed that our favorite dishes were the Roasted Asparagus & Farro Salad as well as the gnocchi. I love your detailed review, sounds like a great place. Thanks for sharing! Such a lovely review! I absolutely love the pics and the food looks incredible. This place sounds amazing. Were those all vegetarian food? Love it! Yum everything looks so delicious! Especially that dip! the place looks so cozy! wish i could visit there someday! Oh my! All the food looks amazing. It's been so long since I've had tagine. I would love to try it again. Vegetarian dishes certainly can be fulfilling and flavorful too. This looks so yummy and it needs to get sooner in my tummy! Awesome post! Wow! Great ambience & Yummy food !! This looks soooo goood, I love food and this place looks like it has a great ambience! And it certainly helps that you had a great server too :) I'm in SoCal too so this is definitely a place I would actually be able to go to as well! All that food looks amazing, and the gnocchi sounds incredible! The outside seating looks so quaint and peaceful. 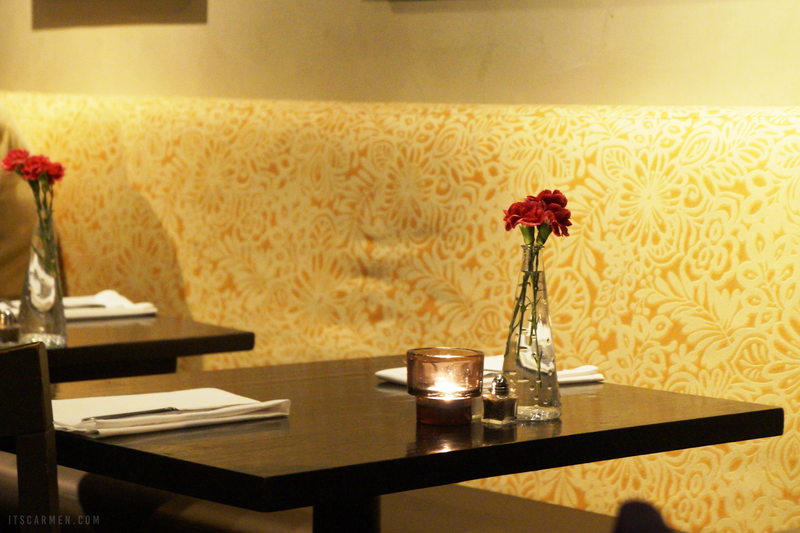 Looks like the perfect place for a date night! This place looks super cute and romantic! And the food looks really good too. Whenever I visit California, I'll be sure to visit this place! Looks yummy! Love to try those food items! Ahhh, all looks SO GOOD. I love restaurant/wineries! Your gnocchi entree sounds amazing... cheesy goodness... mmm...pasta...creamy...carbs... mmm!!! And that torte!? I need that dessert!! Oh my gosh! I just ate a huge lunch and looking at the gnocchi just now made me hungry again. Sounds so yum! This look all so good! It make me super hungry haha. I love going out to have dinner/brunch or whatever and this place looks lovely. That vegetable tagine seems delicious! Yummy! Makes me want to go to a nice fancy dinner date myself. Lovely post. Oh wow. It looks so delicious!!! I am jealous!" Looks like a great place! 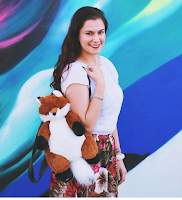 Since we are new(er) to San Diego, there are so many places we haven't been! San Clemente is definitely on my list and I will add the Village Mediterranean Inn, too! Me too. Now I know to just add cheese. Your food photography is great! Yum looks delicious! 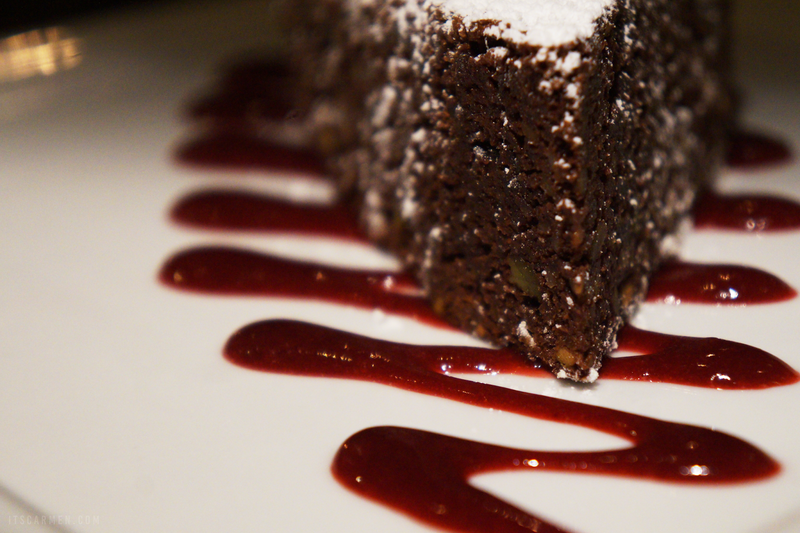 That dessert is making me crave chocolate! Look Awesome Place And Yummy Food!! !